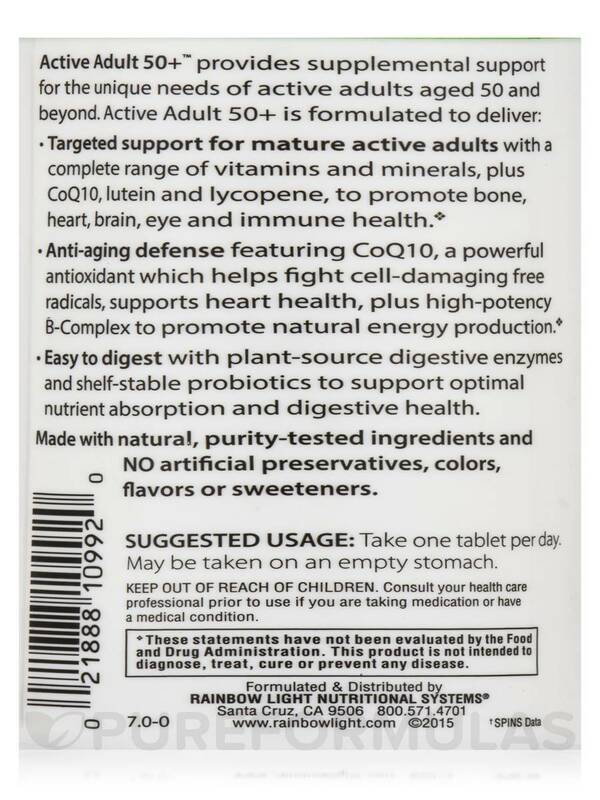 I ordered the Active Adult 50+ by Rainbow Light multi-vitamin that I have used for several years and received it in excellent time. I am very happy with the service, lower cost and free shipping, thank you. 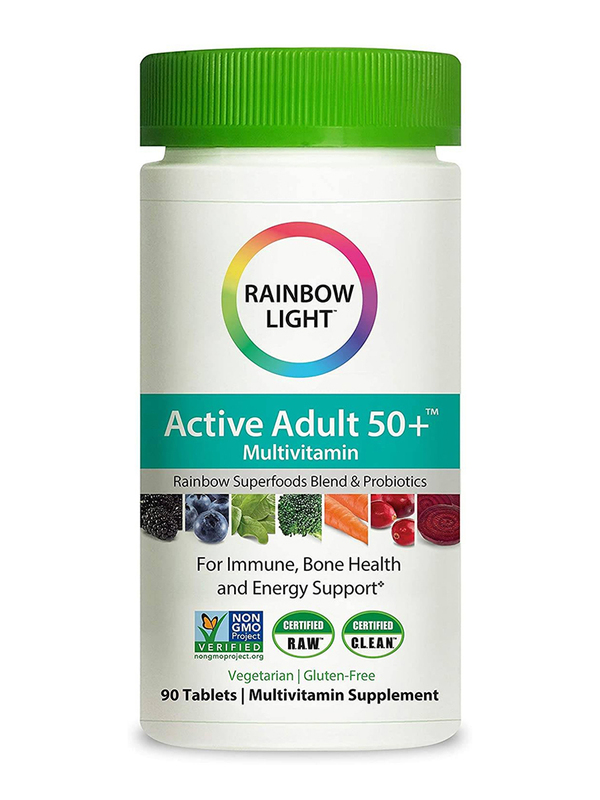 Rainbow Light Active Adult 50+ Mini-Tablet Multivitamin provides essential vitamins‚ minerals‚ antioxidants‚ and foods to naturally nourish and protect mature‚ active adults throughout the day. Three easy-to-swallow mini-tablets per day provide multivitamin protection to address the specific health needs of adults over 50 with vitamin D‚ a potent B-complex‚ Co Q-10‚ extra antioxidant protection‚ and probiotics and plant-sourced enzymes to support overall digestive health. 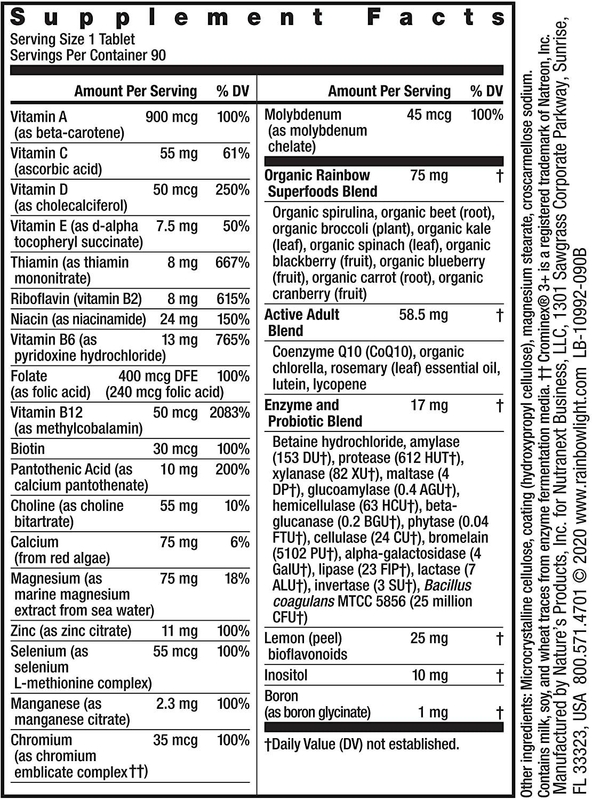 These multivitamins are compatible with many common prescription medications. This supplement provides powerful protection that mature bodies need throughout the day. CoQ-10‚ lutein‚ lycopene‚ selenium‚ Vitamin A‚ Vitamin C and zinc support immune‚ heart‚ eye‚ skin‚ and prostate health and help promote cell growth‚ function‚ and maintenance. A potent vitamin B-complex promotes metabolism of energy from food and supports stress management. In addition‚ 1‚000 IU of vitamin D3 promotes calcium absorption for strong bones and teeth. Protease (811 HUT*)‚ amylase (281 DU*)‚ lipase (4 FIP*)‚ cellulase (3 CU*)‚ betaine HCI (20mg*). Other Ingredients (Natural mineral or vegetable source): Cellulose‚ magnesium stearate‚ modified cellulose‚ silica‚ coating: vegetable glaze. Contains no: Gluten‚ wheat‚ milk‚ tree nuts‚ peanuts‚ soy‚ eggs‚ fish or shellfish. Take one tablet per day. May be taken on an empty stomach. I am 81 and very active, I think due to in part to this vitamin accompanied by regular exercise. 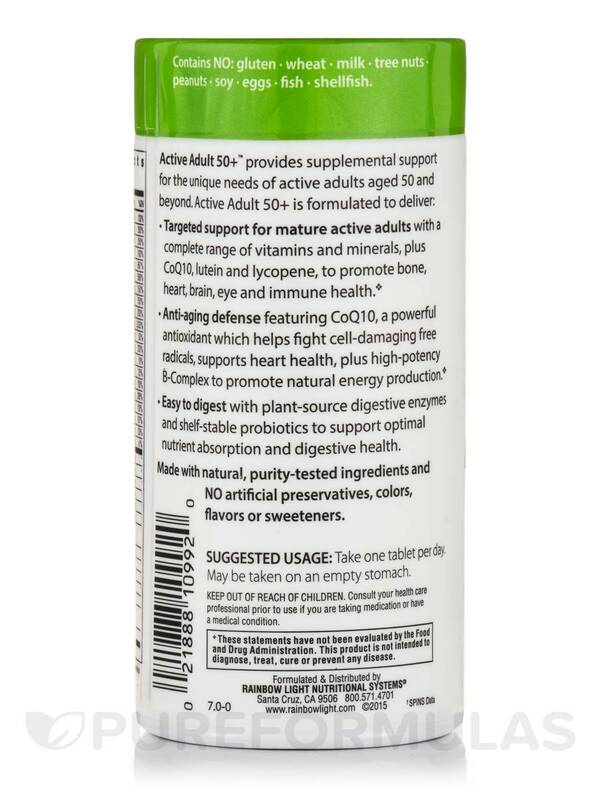 Active Senior SafeGuard Multivitamin is a great product! 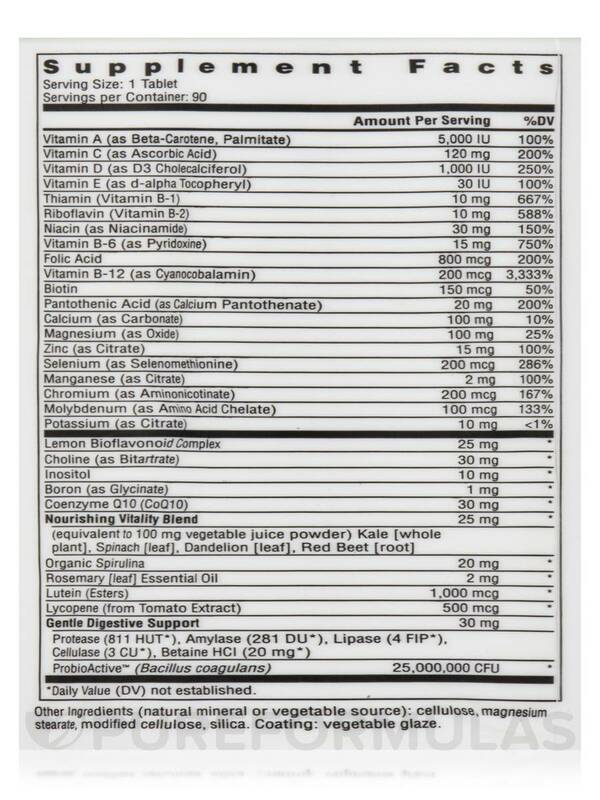 DOES QUERCETIN WITH BROMELAIN HELP RUNNING EYE DUE TO ALLERGIES? Thank you for your question, Johanne. The manufacturer indicates that this product protects heart, bone, brain, eye and immune health to help stay energetic, sharp and healthy. There is no indication if it can help with allergy relief.